Green.ch Review 2019: Is Green.ch a Good Hosting? Green.ch had its beginnings as a local internet provider in Switzerland. Founded by the Swiss Farmers’ Association in 1995, they’ve since grown to become the fifth largest internet provider in the country. Green.ch had its humble beginnings as a local internet provider in Switzerland. Founded by the Swiss Farmers’ Association in 1995, they’ve since grown to become the fifth largest internet provider in the country and have expanded their offerings to include digital TV, telephony, web hosting, and domain registration services. They operate five of their own data centers – all based in Switzerland – and have built over 100,000 customer relationships. Their most basic plan seems generous with its allotment of storage and bandwidth, but also comes with a correspondingly higher price tag. Also, note that the Start and Comfort plan do not include a website builder or Content Management System (CMS) – you’ll have to purchase at least their Plus plan for that. The Start plan also does not include a one-click installation of WordPress, so beginners might hit a steeper learning curve. 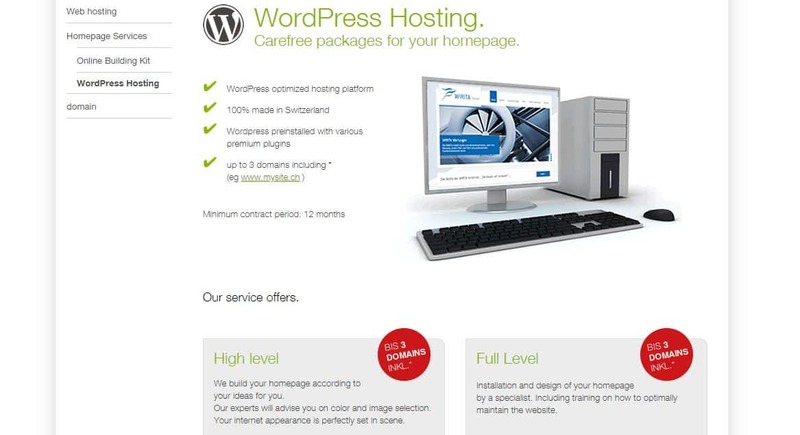 Then again, they do offer a customizable WordPress hosting package where they create your entire WordPress site and then host it for you, so that should suffice. The price may be a deterrent for cash-strapped individuals or businesses, though. None of the plans include SSL certification, so that’ll have to be purchased separately. On the upside, they do provide free daily backups with copies spread across multiple data centers, so you can rest assured that your data will be extremely well-protected should any mishaps occur. As a Swiss company, they also enjoy the extra protection that makes their country such a popular haven for corporations. Switzerland is economically independent and politically stable, which means businesses cannot be forced to disclose information about their clients (unless, of course, the authorities are investigating a client and are able to obtain an injunction). This point will be particularly attractive for security-conscious businesses. I found Green.ch’s hosting plans a little pricey. Their shared hosting plans may come with decent storage, bandwidth, and ample email accounts, but the entry-level plan doesn’t include a free domain registration, even considering the higher price you’re paying. Also, it only includes one MySQL database, which seems stingy. There’s no free version available, nor does there seem to be a money back guarantee. They do have a reputation for being very reliable, but it remains to be seen how convenient it is to host your website with them – perhaps this is the trade-off for all that extra security. Support is available in three languages – a testament to Swiss multilingualism. However, their telephone hotline is only available during Swiss business hours (8AM – 5.30PM Monday to Friday), which may prove challenging for international customers. The alternative is to email their support or submit a request via their online form, but you may only get a reply the next business day. There’s no live chat available. Green.ch is strong on privacy and data security, and their core offerings as a telecommunications and internet services provider seem to have a slant towards that. They will likely appeal to a more security-conscious crowd who are willing to pay for the added protection. Wondering how Green.ch stacks up against other Web Hosting companies? Enter any other Web Hosting company and we will give you a side-by-side comparison.